Be the first to share your favorite memory, photo or story of Armin . This memorial page is dedicated for family, friends and future generations to celebrate the life of their loved one. Armin “Eddie” Schaible, 82, passed away Sunday, March 31, 2019 in his Magnolia home with family by his side. Armin was born June 5, 1936 in Ludwigsburg Germany. Growing up in post-war Germany, Armin was smitten by American Country Music and immigrated to Nashville in 1960 to pursue a career in the industry. Upon his arrival in Nashville, he adopted the stage name Eddie Wilson under which he published several singles. As much as he loved his music, his greatest accomplishments were his family. In 1961 Eddie met his wife Buna (Reynolds) whom he married in winter of that same year. The couple welcomed their first daughter, Sandy in 1962, followed by Conny in 1965, and son Paul in 1969. In the 1970’s, they moved to Texas where Eddie joined the Houston Liederkranz. 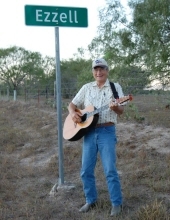 In the early 1990’s, the couple moved to Walburg, Texas when Ed became a member of The Walburg Boys. After years in the German folk music scene, the pair bought a house in Magnolia, Texas and retired in 2002. Ed and Buna spent 51 beautiful years together on Earth and are united again for eternity. Eddie was preceded in death by his parents; his son, Paul Schaible; and his wife Buna. Ed is survived by his daughters- Sandy Schaible and wife Carla, Conny Schaible; Granddaughters- Shannon Fasick and husband David, Emily Gehring; Great-Grandchildren- Makenzie and Phoenix Herold; Brother- Raimund and wife Gisela; his sisters In-law, nieces, nephews, cousins and many friends from across the world. Eddie lived a long, wonderful, beautiful life full of love and laughter. The family has chosen to have a Celebration of Life in the coming months to best commemorate the life of the greatest man they ever knew. To send flowers or a remembrance gift to the family of Armin “Eddie” Schaible, please visit our Tribute Store. "Email Address" would like to share the life celebration of Armin “Eddie” Schaible. Click on the "link" to go to share a favorite memory or leave a condolence message for the family.